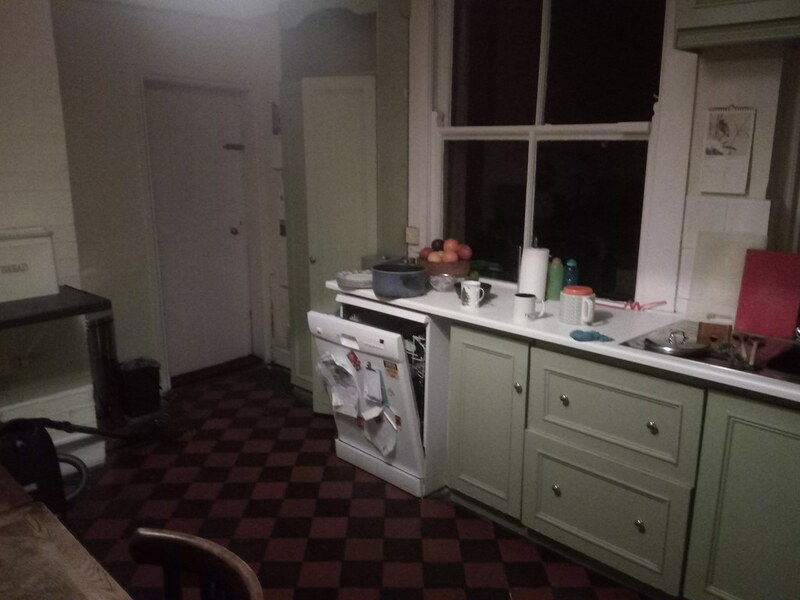 When we moved in to this house 6 years ago, we did some work but stopped before we got to the kitchen as we couldn’t afford any further work. 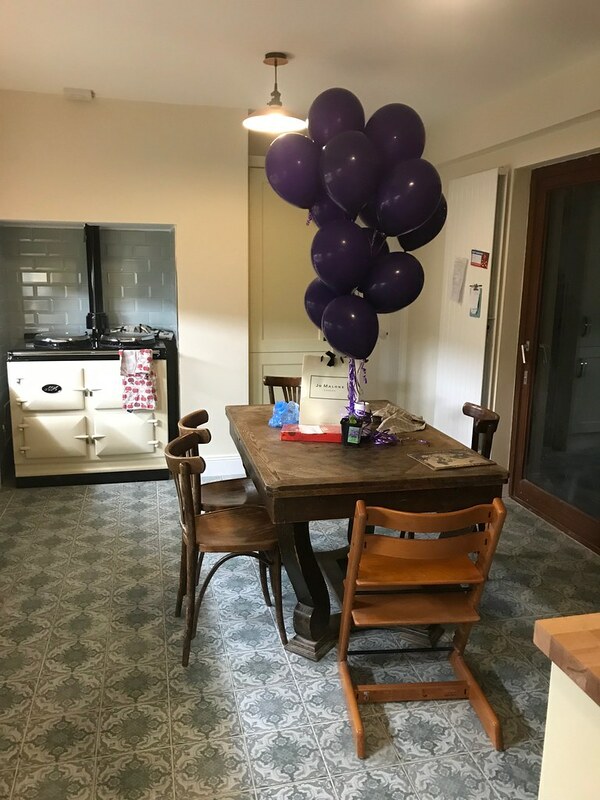 For six long years, we lived with a freezing kitchen and a corner where you could see the earth as the tiles had disappeared – the tiles were laid on earth, the walls were uninsulated, no wonder it was freezing. 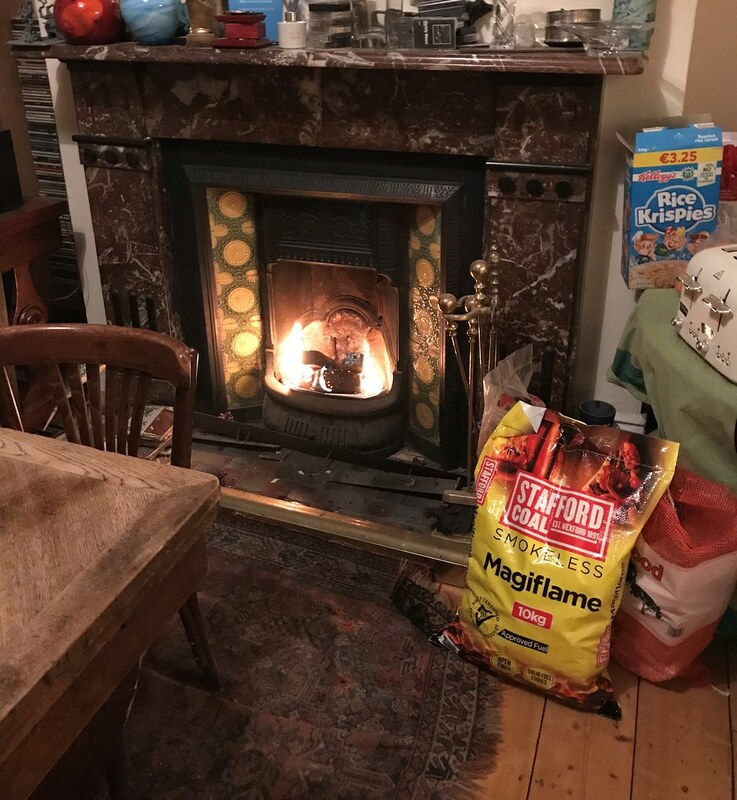 When deciding to renovate the kitchen, my main objective was to get to a situation where all of my children would feel happy eating in the kitchen in winter with their coats off. We spent all of last year deciding that we couldn’t afford to knock down the utility room at the same time and, even more time consuming, finding a builder. We had a number of false dawns with the builder due to start in the summer while we were on holidays, in the autumn while Herself was in France and finally at the start of December. I wouldn’t let them start in early December because I knew that despite their assertions, they would not be finished by Christmas. I now know that had we let them go ahead we would have had no kitchen wall at Christmas so go me. They were due to definitely, definitely start on January 2 and finally did start on January 9. It took forever and the house was full of dust for months. They left about 2 weeks ago but we still have their cement mixer, our snag list and an outstanding payment of €5,000 so I am hoping that they’ll come back. The whole thing was a bit grim. At every stage there were unanticipated questions and decisions to make and it took a lot out of us. 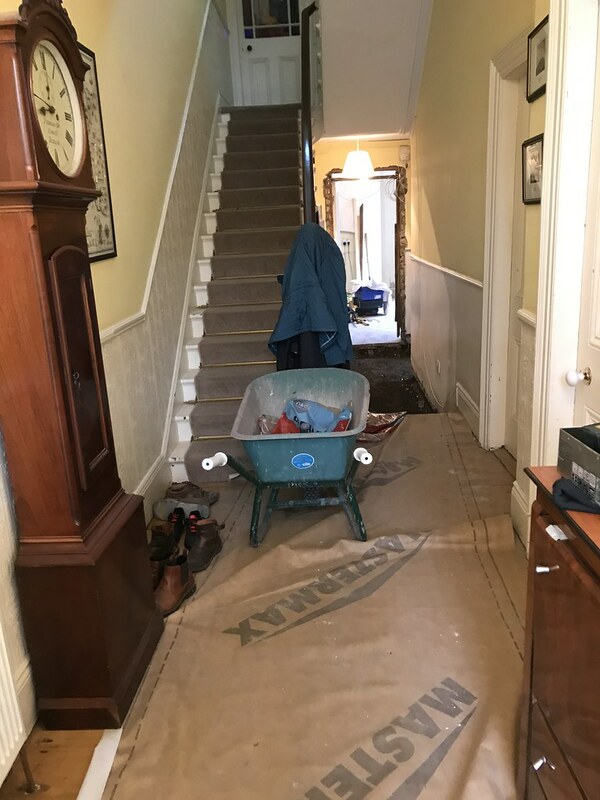 The enemy of promise: the wheelbarrow in the hall. We put in a downstairs bathroom as well and the window frame for it was the wrong colour, there was a scratch on the chrome unit (which I wouldn’t have noticed had it not been dutifully pointed out to me by the plumber) and although the room is tiny due to pipe positioning it is laid out like a chicane. I have made my peace with it. In the kitchen, we wanted to save our Victorian tiles but we couldn’t (currently residing in the shed along with the original Victorian window as we can’t bear to get rid of tiles or window but have no immediate plans for either). Choosing new tiles in a showroom out in the middle of nowhere at short notice does not rank as a high point in the process. Also, incidentally, trendy Outhaus tiles, who closes their showroom on a Saturday morning? 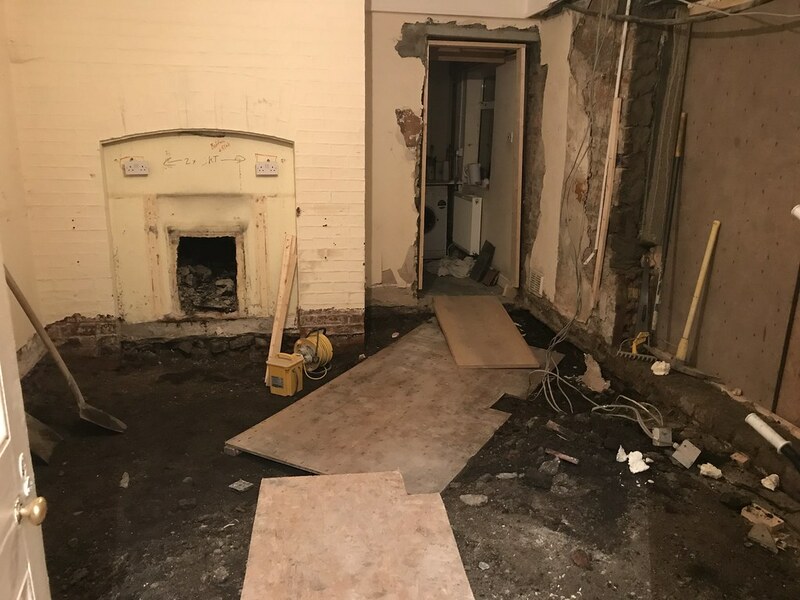 The fridge turned out to be slightly too big for its allotted spot as the bricks on the alcove beside it were supposed to be only cladding and removed but were not and the fridge had to be put over the architrave of the door to the utility room. The alcove which we had was insufficiently large to accommodate my mid-life crisis Aga so it had to be knocked down and despite reassurance that the arch could be rebuilt, it kind of couldn’t be. And then due to the flue positioning, the Aga still stuck out of its wretched specially created alcove. Of course when it actually arrived, Herself took one look at it and described it as an “environmental crime scene”. Mr. Waffle said, “You’ll be able to tell people that your mother got one just before they were banned.” Adding further insult to injury, the front of the Aga had some microscopic break which necessitated the replacement of the front – they were v apologetic and all that but although due end March, it still hasn’t arrived. The fitted kitchen wasn’t exactly the colour I expected (I thought it would be cream, it’s more yellow, I call it in the best Farrow and Ball style ‘a touch of bile’) and the handles I selected online were…larger than I expected. I have made my peace with this too. We lost a wall as well during the coldest time of the year. Although that was not unexpected, it wasn’t exactly pleasant either; especially when the central heating went down. We lit the fire in the dining room for the first time. To stop ourselves freezing to death. Notwithstanding the snag list and the Aga repairs, I am declaring our project complete. Am I pleased? Actually, I am. It’s not exactly what I wanted but it’s comfortable and the children can now all take their coats off in the kitchen and, chicane notwithstanding, a downstairs bathroom is a welcome development. 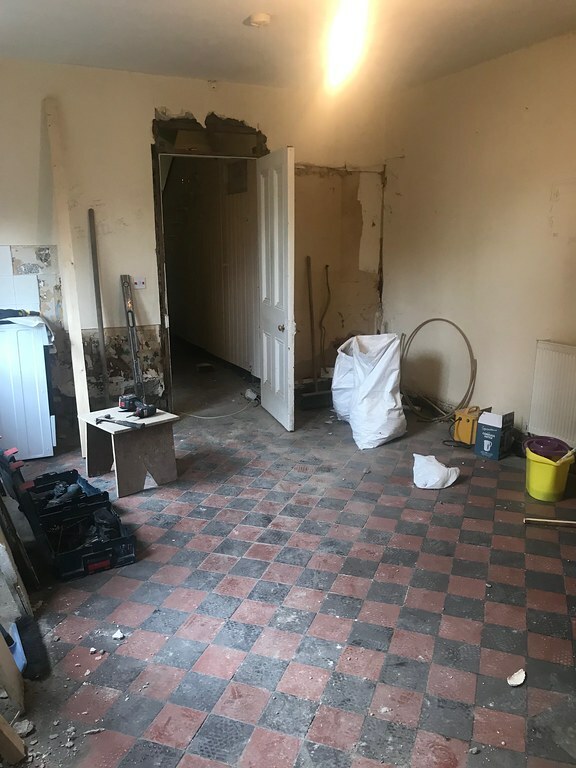 I am not sure, however, that even when we can afford it, we will ever be strong enough to face bringing builders back into the house so the utility room may remain unchanged.